Definition at line 23 of file AArch64InstPrinter.h. Definition at line 44 of file AArch64InstPrinter.cpp. Referenced by getRegName(), and llvm::AArch64AppleInstPrinter::getRegName(). Definition at line 42 of file AArch64InstPrinter.h. References getRegisterName(), printImm(), printImmHex(), printImmSVE(), printOperand(), printPostIncOperand(), and printSysAlias(). Definition at line 925 of file AArch64InstPrinter.cpp. References assert(), llvm::MCInstPrinter::CommentStream, llvm::MCInstPrinter::formatImm(), llvm::MCOperand::getExpr(), llvm::MCOperand::getImm(), llvm::MCInst::getOperand(), llvm::AArch64_AM::getShiftValue(), llvm::MCOperand::isExpr(), llvm::MCOperand::isImm(), llvm::MCInstPrinter::MAI, llvm::MCExpr::print(), and printShifter(). Definition at line 1354 of file AArch64InstPrinter.cpp. References llvm::MCInstPrinter::formatImm(), llvm::MCOperand::getExpr(), llvm::MCOperand::getImm(), llvm::MCInst::getOperand(), llvm::MCOperand::isImm(), llvm::MCInstPrinter::MAI, and llvm::MCExpr::print(). Definition at line 1329 of file AArch64InstPrinter.cpp. References llvm::Address, llvm::dyn_cast(), llvm::MCExpr::evaluateAsAbsolute(), llvm::MCInstPrinter::formatImm(), llvm::MCOperand::getExpr(), llvm::MCOperand::getImm(), llvm::MCInst::getOperand(), llvm::MCOperand::isImm(), llvm::MCInstPrinter::MAI, llvm::MCExpr::print(), and llvm::raw_ostream::write_hex(). Definition at line 1087 of file AArch64InstPrinter.cpp. References assert(), llvm::MCInstPrinter::formatImm(), llvm::MCOperand::getExpr(), llvm::MCOperand::getImm(), llvm::MCInst::getOperand(), llvm::MCOperand::getReg(), llvm::AArch64AppleInstPrinter::getRegisterName(), llvm::MCOperand::isExpr(), llvm::MCOperand::isImm(), llvm::MCInstPrinter::MAI, and llvm::MCExpr::print(). Referenced by printAMIndexedWB(), and printMemExtend(). Definition at line 114 of file AArch64InstPrinter.h. References printAdrpLabel(), printAMIndexedWB(), printAMNoIndex(), printBarrierOption(), printBTIHintOp(), printComplexRotationOp(), printExactFPImm(), printFPImmOperand(), printGPR64as32(), printGPRSeqPairsClassOperand(), printImm8OptLsl(), printImmScale(), printImplicitlyTypedVectorList(), printMRSSystemRegister(), printMSRSystemRegister(), printPrefetchOp(), printPSBHintOp(), printSIMDType10Operand(), printSVELogicalImm(), printSVEPattern(), printSVERegOp(), printSystemPStateField(), printTypedVectorList(), printVectorIndex(), printVectorList(), and printZPRasFPR(). Definition at line 1063 of file AArch64InstPrinter.cpp. References llvm::MCInst::getOperand(), llvm::MCOperand::getReg(), and llvm::AArch64AppleInstPrinter::getRegisterName(). Definition at line 982 of file AArch64InstPrinter.cpp. References llvm::AArch64_AM::getArithExtendType(), llvm::AArch64_AM::getArithShiftValue(), llvm::MCOperand::getImm(), llvm::MCInst::getOperand(), llvm::MCOperand::getReg(), llvm::AArch64_AM::getShiftExtendName(), llvm::AArch64_AM::UXTW, and llvm::AArch64_AM::UXTX. Referenced by printExtendedRegister(), and printPostIncOperand(). Definition at line 1370 of file AArch64InstPrinter.cpp. References llvm::StringRef::empty(), llvm::MCOperand::getImm(), llvm::MCInst::getOpcode(), llvm::MCInst::getOperand(), and Name. Definition at line 1130 of file AArch64InstPrinter.cpp. References llvm::MCInstPrinter::formatImm(), llvm::MCOperand::getImm(), and llvm::MCInst::getOperand(). Definition at line 1454 of file AArch64InstPrinter.cpp. Definition at line 1049 of file AArch64InstPrinter.cpp. References llvm::AArch64CC::getCondCodeName(), llvm::MCOperand::getImm(), and llvm::MCInst::getOperand(). Definition at line 1573 of file AArch64InstPrinter.cpp. Definition at line 975 of file AArch64InstPrinter.cpp. References llvm::MCInst::getOperand(), llvm::MCOperand::getReg(), llvm::AArch64AppleInstPrinter::getRegisterName(), and printArithExtend(). Definition at line 1141 of file AArch64InstPrinter.cpp. References llvm::format(), llvm::MCOperand::getFPImm(), llvm::AArch64_AM::getFPImmFloat(), llvm::MCOperand::getImm(), llvm::MCInst::getOperand(), and llvm::MCOperand::isFPImm(). Definition at line 1582 of file AArch64InstPrinter.cpp. References llvm::MCInst::getOperand(), llvm::MCOperand::getReg(), llvm::AArch64AppleInstPrinter::getRegisterName(), llvm::getWRegFromXReg(), and Reg. Definition at line 1233 of file AArch64InstPrinter.cpp. References llvm::MCInst::getOperand(), llvm::MCOperand::getReg(), llvm::AArch64AppleInstPrinter::getRegisterName(), llvm::MCRegisterInfo::getSubReg(), llvm::MCInstPrinter::MRI, Reg, and llvm::size(). Definition at line 881 of file AArch64InstPrinter.cpp. Referenced by getRegName(), and printOperand(). Definition at line 1511 of file AArch64InstPrinter.cpp. References assert(), llvm::MCInstPrinter::formatImm(), llvm::MCOperand::getImm(), llvm::MCInst::getOperand(), llvm::AArch64_AM::getShiftType(), llvm::AArch64_AM::getShiftValue(), llvm::AArch64_AM::LSL, printImmSVE(), and printShifter(). Definition at line 888 of file AArch64InstPrinter.cpp. References llvm::format(), llvm::MCOperand::getImm(), and llvm::MCInst::getOperand(). Definition at line 1070 of file AArch64InstPrinter.cpp. Definition at line 1493 of file AArch64InstPrinter.cpp. References llvm::MCInstPrinter::CommentStream, llvm::MCInstPrinter::formatDec(), llvm::MCInstPrinter::formatHex(), and llvm::MCInstPrinter::getPrintImmHex(). Referenced by getRegName(), printImm8OptLsl(), and printSVELogicalImm(). Print a list of vector registers where the type suffix is implicit (i.e. attached to the instruction rather than the registers). Definition at line 1303 of file AArch64InstPrinter.cpp. Definition at line 59 of file AArch64InstPrinter.cpp. References llvm::atomicBarrierDroppedOnZero(), llvm::AArch64_AM::decodeLogicalImmediate(), llvm::MCInstPrinter::formatImm(), llvm::MCAsmInfo::getCommentString(), llvm::MCOperand::getExpr(), llvm::MCOperand::getImm(), llvm::MCInst::getOpcode(), llvm::MCInst::getOperand(), llvm::MCOperand::getReg(), llvm::AArch64AppleInstPrinter::getRegisterName(), llvm::getWRegFromXReg(), llvm::AArch64_AM::isAnyMOVWMovAlias(), llvm::MCOperand::isExpr(), llvm::MCOperand::isImm(), llvm::AArch64_AM::isMOVNMovAlias(), llvm::AArch64_AM::isMOVZMovAlias(), llvm::MCInstPrinter::MAI, llvm::MCExpr::print(), llvm::AArch64AppleInstPrinter::printAliasInstr(), llvm::MCInstPrinter::printAnnotation(), llvm::AArch64AppleInstPrinter::printInstruction(), printSysAlias(), and llvm::SignExtend64(). Definition at line 1056 of file AArch64InstPrinter.cpp. References llvm::AArch64CC::getCondCodeName(), llvm::MCOperand::getImm(), llvm::AArch64CC::getInvertedCondCode(), and llvm::MCInst::getOperand(). Definition at line 948 of file AArch64InstPrinter.cpp. References llvm::AArch64_AM::decodeLogicalImmediate(), llvm::MCOperand::getImm(), llvm::MCInst::getOperand(), and llvm::raw_ostream::write_hex(). Definition at line 1023 of file AArch64InstPrinter.cpp. References llvm::MCOperand::getImm(), llvm::MCInst::getOperand(), and printMemExtendImpl(). Referenced by printMemExtend(), and printPostIncOperand(). Definition at line 89 of file AArch64InstPrinter.h. References printAlignedLabel(), printAMIndexedWB(), printCondCode(), printInverseCondCode(), printMemExtend(), printRegWithShiftExtend(), and printUImm12Offset(). Definition at line 1393 of file AArch64InstPrinter.cpp. References llvm::AArch64SysReg::genericRegisterString(), llvm::MCSubtargetInfo::getFeatureBits(), llvm::MCOperand::getImm(), llvm::MCInst::getOperand(), llvm::AArch64SysReg::SysReg::haveFeatures(), llvm::AArch64SysReg::lookupSysRegByEncoding(), llvm::AArch64SysReg::SysReg::Name, llvm::AArch64SysReg::SysReg::Readable, and Reg. Definition at line 1413 of file AArch64InstPrinter.cpp. References llvm::AArch64SysReg::genericRegisterString(), llvm::MCSubtargetInfo::getFeatureBits(), llvm::MCOperand::getImm(), llvm::MCInst::getOperand(), llvm::AArch64SysReg::SysReg::haveFeatures(), llvm::AArch64SysReg::lookupSysRegByEncoding(), llvm::AArch64SysReg::SysReg::Name, Reg, and llvm::AArch64SysReg::SysReg::Writeable. Definition at line 866 of file AArch64InstPrinter.cpp. References assert(), llvm::MCOperand::getExpr(), llvm::MCInst::getOperand(), llvm::MCOperand::getReg(), llvm::AArch64AppleInstPrinter::getRegisterName(), llvm::MCOperand::isExpr(), llvm::MCOperand::isImm(), llvm::MCOperand::isReg(), llvm::MCInstPrinter::MAI, llvm::MCExpr::print(), printImm(), and Reg. Referenced by getRegName(), and printRegWithShiftExtend(). Definition at line 895 of file AArch64InstPrinter.cpp. References llvm::MCInst::getOperand(), llvm::MCOperand::getReg(), llvm::AArch64AppleInstPrinter::getRegisterName(), llvm::MCOperand::isReg(), llvm_unreachable, and Reg. Referenced by getRegName(), and printPostIncOperand(). Definition at line 63 of file AArch64InstPrinter.h. References printAddSubImm(), printArithExtend(), printExtendedRegister(), printLogicalImm(), printMemExtend(), printPostIncOperand(), printShiftedRegister(), printShifter(), printSysCROperand(), and printVRegOperand(). Definition at line 1102 of file AArch64InstPrinter.cpp. Definition at line 1119 of file AArch64InstPrinter.cpp. 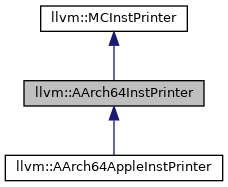 Definition at line 54 of file AArch64InstPrinter.cpp. Definition at line 1032 of file AArch64InstPrinter.cpp. References assert(), printMemExtendImpl(), and printOperand(). Definition at line 968 of file AArch64InstPrinter.cpp. References llvm::MCInst::getOperand(), llvm::MCOperand::getReg(), llvm::AArch64AppleInstPrinter::getRegisterName(), and printShifter(). Definition at line 956 of file AArch64InstPrinter.cpp. References llvm::MCOperand::getImm(), llvm::MCInst::getOperand(), llvm::AArch64_AM::getShiftExtendName(), llvm::AArch64_AM::getShiftType(), llvm::AArch64_AM::getShiftValue(), and llvm::AArch64_AM::LSL. Referenced by printAddSubImm(), printImm8OptLsl(), printPostIncOperand(), and printShiftedRegister(). Definition at line 1445 of file AArch64InstPrinter.cpp. References llvm::AArch64_AM::decodeAdvSIMDModImmType10(), llvm::format(), llvm::MCOperand::getImm(), and llvm::MCInst::getOperand(). Definition at line 1536 of file AArch64InstPrinter.cpp. References llvm::AArch64_AM::decodeLogicalImmediate(), llvm::MCInstPrinter::formatHex(), llvm::MCOperand::getImm(), llvm::MCInst::getOperand(), and printImmSVE(). Definition at line 1461 of file AArch64InstPrinter.cpp. Definition at line 1472 of file AArch64InstPrinter.cpp. References llvm::MCInst::getOperand(), llvm::MCOperand::getReg(), llvm::AArch64AppleInstPrinter::getRegisterName(), llvm_unreachable, and Reg. Definition at line 753 of file AArch64InstPrinter.cpp. References assert(), DC, llvm::MCSubtargetInfo::getFeatureBits(), llvm::MCOperand::getImm(), llvm::MCInst::getOpcode(), llvm::MCInst::getOperand(), llvm::MCOperand::getReg(), llvm::AArch64AppleInstPrinter::getRegisterName(), llvm::SysAlias::haveFeatures(), llvm::MipsISD::Ins, Name, llvm::SysAlias::Name, llvm::SysAliasReg::NeedsReg, and llvm::transform(). Referenced by getRegName(), and printInst(). Definition at line 917 of file AArch64InstPrinter.cpp. Definition at line 1433 of file AArch64InstPrinter.cpp. References llvm::MCInstPrinter::formatImm(), llvm::MCSubtargetInfo::getFeatureBits(), llvm::MCOperand::getImm(), and llvm::MCInst::getOperand(). Definition at line 1311 of file AArch64InstPrinter.cpp. Definition at line 1076 of file AArch64InstPrinter.cpp. References assert(), llvm::MCInstPrinter::formatImm(), llvm::MCOperand::getExpr(), llvm::MCOperand::getImm(), llvm::MCInst::getOperand(), llvm::MCOperand::isExpr(), llvm::MCOperand::isImm(), llvm::MCInstPrinter::MAI, and llvm::MCExpr::print(). Referenced by printMemExtend(), and printUImm12Offset(). Definition at line 108 of file AArch64InstPrinter.h. Definition at line 1323 of file AArch64InstPrinter.cpp. Definition at line 1249 of file AArch64InstPrinter.cpp. References llvm::MCRegisterClass::contains(), llvm::MCRegisterInfo::getMatchingSuperReg(), getNextVectorRegister(), llvm::MCInst::getOperand(), llvm::MCOperand::getReg(), llvm::MCRegisterInfo::getRegClass(), llvm::AArch64AppleInstPrinter::getRegisterName(), llvm::MCRegisterInfo::getSubReg(), llvm::MCInstPrinter::MRI, and Reg. 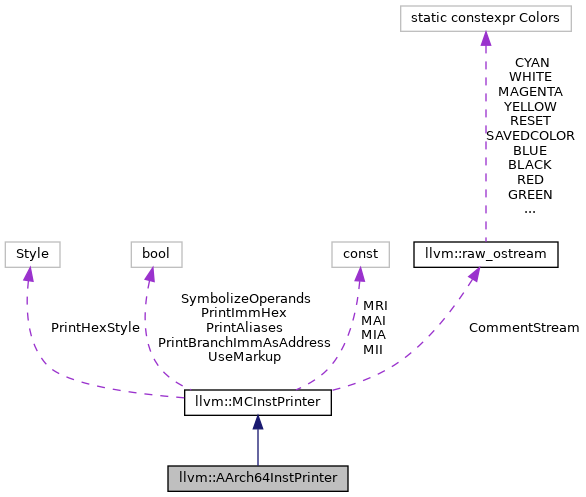 Referenced by printAMIndexedWB(), printImplicitlyTypedVectorList(), llvm::AArch64AppleInstPrinter::printInst(), and printTypedVectorList(). Definition at line 908 of file AArch64InstPrinter.cpp. References assert(), llvm::MCInst::getOperand(), llvm::MCOperand::getReg(), llvm::AArch64AppleInstPrinter::getRegisterName(), llvm::MCOperand::isReg(), and Reg. Definition at line 1555 of file AArch64InstPrinter.cpp.